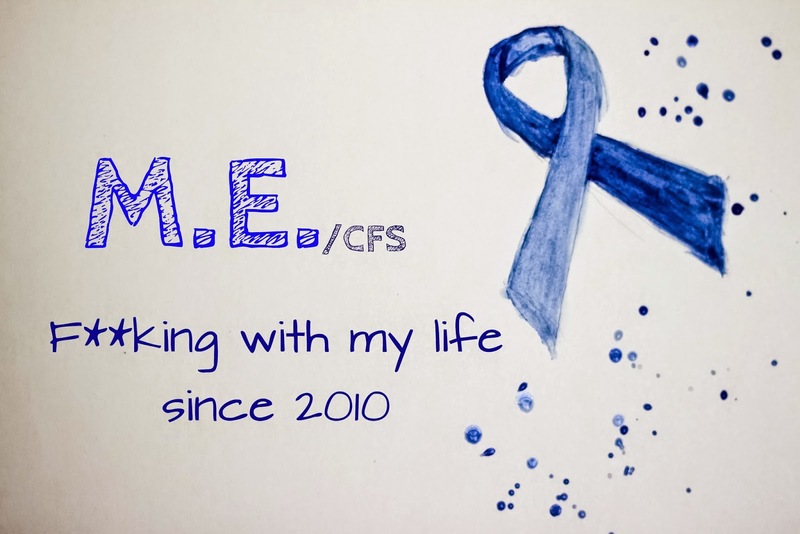 body, chronically ill, disability, lifestyle, M.E. I very rarely talk about my M.E. on here & I know that might seem weird to some people but I try very hard not to let my M.E. take over more of my life than it already has. Stupid I know but I have to maintain some semblance of control. I'm not sure what to start talking about first...I'm already feeling awkward talking about this. I feel like I'm drawing attention to myself when I shouldn't be you know? This isn't a good thing or a nice thing or even an interesting thing. Or at least not for me. We all know that M.E. is not very well understood & that a lot of people's diagnoses were given because Doctors had no idea what was going on (unlike most diagnoses). So - since we could all be walking around with totally different conditions that just have similar symptoms - my experience may be TOTALLY different to yours. (Just a little disclaimer). I developed my M.E. the autumn after I turned 17 during a complex, & kind of gnarly, kidney thing (to this day I still don't know what was going on there). Looking back I had a bug that I couldn't shift the summer before that might actually have been the start of the M.E. but with the much more scary kidney thing happening - there was blood & lots of tests & A&E visits - I didn't really pay attention to it. Anyway, by the end of January I had been diagnosed with M.E. & by April that year I was using a wheelchair when I left the house for any distance. I'd still walk around ASDAs a little bit with my Mum sometimes (clinging desperately to the trolley for support & going to the café trying not to faint when I walked too far) but I was really struggling. All of this happened during the second year of my A-Levels, the year you apply to universities and stuff. In between trips to A&E, test & hospital stays I had applied to Oxford, done the pre-interview exam, gone to the interviews (suffering from Depression, M.E. & the kidney thing...) and gotten offered a place. Looking back I really don't know how I did it. Unfortunately by the end of December I had realised that my school work was suffering & I needed time to 'let my body heal'. The months until I went back to school were hard. I struggled to study at all, I ached all over &....I had M.E. you know? I didn't know how to deal with it & I hated the way it surrounded my brain in a fog. I knew school was going to be hard but I had been told that M.E. lasted a MAXIMUM of 3-5 years so I knew I was going to get better. If I could remember who told me that I would go slap them so hard! When I went back into school that September I could manage 2 or 3 hours of work a day (no more than 1 hour at a time), I was using a wheelchair but I could self-propel it a little way (although it was exhausting) & I could still manage to read academic texts. It was hard to manage the school work but I was still maintaining my A-A* grade predictions. In January I had my first set of exams. From what I know of the way my body is with the M.E., January was a crap time to do exams. I always get a horrible flare starting around mid-January which sets me back a really long way. I got an E in my psychology exam & I was so ill afterwards that I was hallucinating (more like dreaming whilst awake) & bedbound. It wasn't good. So I dropped out of school again & it nearly killed me. Not literally but I kind of knew that I was giving up on Oxford, probably forever. But I still thought I was going to get better. But then the next January I had another flare & then the next January I had another flare & I realised that after every flare I was getting worse. I couldn't walk as far, I'd get a new symptom, things I could before were too tiring now & even after the flare...things wouldn't pick up that much. They'd get a bit better but they'd never get as good as they had been before. Fast forward to now. I caved in October & got an electric wheelchair. I know that my M.E. is degenerating, it is literally getting worse every year, and I have given up on getting better. If I do get better that would be nice but I'm not really buying that. People literally die of M.E., it happens, I don't want to die of this mess having spent what's left of my life/health waiting to get better. I want to have no regrets from this part of my life because I have enough regrets from the last part of it. That may seem un-natural but it is how I cope & I am happy with my life as it stands. Health wise....on a really good day I can walk about 7m & even then I struggle & stumble & would use prefer to crutches. I struggle with reading & screens & sound & light &....life you know? I look at the international consensus criteria for M.E. & it's like someone wrote down my life. My brain is affected less than my body by my M.E., or at least that's how it seems to me...not that it's not affected, just affected a little less. Sometimes my brain will, for lack of a better word, cease up. It's in there, working like crazy but I can't make my mouth move to speak...sometimes it affects my body too. Despite all of this, I tend not to get super brain fatigued - possibly because I am really careful but it might also because my brain is not doing too bad. When I get at all tired though by brain can get overloaded, it's hard to think or make decisions, I struggle to remember things & I get these awful burning headaches that I would swear was lactic acid burning a hole in my brain. My body has issues....I have a lot of muscle weakness, particularly in my legs & I get a lot of pain. I get some CRAZY lactic acid and I can get it sitting still depending on how tired I am. I spasm, quite a lot these days, and my baclofen doesn't fully control that. Most of my spasming is a twitching kind of spasm but there are also freezing spasms & what I call brain spasms where my body does something that my brain has half thought or had some connection to (like something I've read in a book or heard or seen on TV). I am in a lot of pain & a lot of the time and my pain killers don't seem to do much. Most of the time I am housebound, I go out once or twice a week at a maximum. I am pretty good at pacing, it's one of my great skills, so I don't tend to get over tired but I know my limits & one or two short outings a week is my outside limit....if I am maintaining my usual levels of day to day activity. If I've got something big I need to do I 'save up' energy by doing less before & after. Obviously once I've done something which used more energy than I had to spare I get exhausted - dizzy, heart racing, panting for breath, simple things make me knackered, I feel groggy & bunged up &....exhausted. I get weird gland pains, abdominal pains that could be what's left over from my 'kidney thing' or it could be the M.E. - who knows - I have problems with acid foods due to a persistent sore throat & fresh garlic makes me nauseous amongst other food sensitivities....most of which are based on my favourite pre-M.E. foods. I have problems with temperature regulation, bouncing between freezing & hot flushes...I almost always have no idea what the real temperature is. I'm probably missing out a few body symptoms, I'm so used to the M.E. it's hard to remember what's the M.E., so much of it just seems normal now. Emotionally though, my energy gets a real knocking because my family is hard work & emotionally exhausting. Blame my dad & foster brother for that. I'll get weepy or emotionally....grey I call it. So tired & my emotions don't know what they're supposed to be doing so they just go floppy & don't do anything really. It's similar emotionally to depression (not the same though, I know depression - I had it the year before I developed the kidney problem - & this is different). Obviously I struggle to sleep & even when I do sleep it's not exactly worth it...I also get these awful vivid dreams that are so real that they are tiring....when I really struggle to sleep or get stupid tired I get these dream when I'm awake.... Super fun obviously. I hope I've fully explained my M.E. It's so all consuming & there are so many weird symptoms that I'm never really sure what to say about it. How do you explain that some days I can have gone half the distance I can usually manage in my chair & suddenly I collapse & can't do anything anymore & my brother has to drive my chair back to the car but other days I can play Powerchair football & my chair & I do just fine? How do you explain the mornings when I wake up in no pain at all, almost not remembering I have M.E. & then I try to move & I go into spasm & I realise I was in pain the whole time but I was just so used to it that...it was normal you know & it just felt like the rest of my life? How do you explain the 'holes' in my brain? I can feel them & feel round them but no-one understands & I can't explain them because that bit of my logic is stuck in the holes in my brain!!!! Anyway, that's me & M.E., what's your M.E. like? So proud of you for telling everyone your story today, I know some people don't like talking about it, which I completely understand! I hope one day we can say we were cured, and it will all be a distant memory/nightmare... we can only hope! It's not so much that I don't like to talk about my M.E., it's more that I've learnt that no-one wants the realities of my M.E. People don't like to hear about the wacko symptoms or the pain or any of the other complications of having M.E. I have relatives who would rather I had a "clean" problem like cancer or being paralysed because then they wouldn't have to deal with the embarrassment of my condition being misunderstood. Plus my blog doesn't really feel like the right place for talking about the M.E. The blog is supposed to be for the fun, pretty bits of my life, not the black cloud that hangs over it. Hey, this must have been really tricky for you to write. My friend has M.E. so I understand a little already about how hard what you are going through is, although obviously not to your level. I know you'll be skeptical as I'm sure you've tried dozens but I thought I would recommend a book/program to you that has helped me with my anxiety and has honestly changed me massively as a person. I know that the man I saw who did the book with me has helped people M.E. and on the website there are loads of testimonials as well as reviews on amazon. I hope you don't take this the wrong way but I just wanted to pass on my good experience with it and I wish someone had told me about this sooner!